Make way! The Block and Roll Cart from Hape will have children zooming past on their feet in no time. 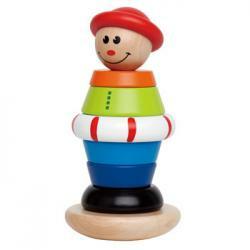 This innovatively designed push and pull toy features a sturdy wooden frame to provide kids a safe, stable base to lean on as they walk farther and farther each day, and brightly painted blocks that add even more entertainment. Solve the puzzle of this cart by arranging the blocks so that each one fits into the cart in one layer, or stack them into impressive structures. Each step encourages the development of coordination, balance, and physical strength, while the block puzzle exercises fine motor skills and problem solving abilities. Cart: W28.3 x L35.3 x H40.8cm. Blocks assorted shapes and colours.